Women in Nuclear Canada wishes to recognize young women who act as pioneers of the nuclear industry and play a pivotal role, in their studies and in their communities, in highlighting the benefits of the nuclear industry. The Women in Nuclear Canada Student Scholarship will be awarded to three (3) deserving applicants (one undergraduate, one graduate and one technical college/trade school). The winners will receive: an engraved plaque, a financial contribution of $3,000.00 each to be put towards their continued pursuit of a career in the nuclear industry and complimentary Conference registration (including accommodations and travel expenses, up to a maximum of $1,500.00). The deadline for applications is Friday, August 17. Feel free to share the links/information on the scholarship within your networks. 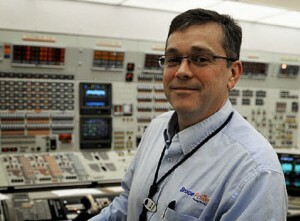 What’s it Like to Work Inside a Nuclear Power Plant? The planned refurbishment of 10 of Ontario’s nuclear reactors is going to help keep electricity prices low in Ontario. It’s a big project that will take 15 years to roll out – and it’s expected to create more than 10,000 jobs, about 90% of them inside the province. But what kind of jobs are they? One of that next generation is Matthew Saldanha, who joined Bruce Power in 2013. As a senior technical engineer officer, Matthew is part of a team that manages any design changes to the plant. He works with his mentors to ensure that the plants’ design integrity is kept intact. By doing this, the team is able to protect the stations’ assets and the public. Matthew describes relations between the plant and nearby communities as very good. “Most people living in the town work at the plant, and in some way or another the plant touches everyone’s lives. It only brings positive things to this area,” he says. Peter agrees, noting that Bruce Power contributes to the community through social events such as beach parties and golf tournaments, and by supporting charities. And both are very comfortable living so close to the plant. “I would live right up against the fence if that’s where I had to be,” says Peter. And even after the refurbishments are done, the plants will keep running for decades, needing skilled people. According to Canadian Manufacturers and Exporters, a single nuclear reactor employs about 640 people full-time, with great pay – and Ontario has 18 of these reactors. Tags Jobs, nuclear power plant, Refurbishment, training, worker | Permalink | Comments Off on What’s it Like to Work Inside a Nuclear Power Plant? Today’s Globe and Mail includes an infographic titled How does nuclear energy benefit Ontario? The image highlights nuclear as the best option for clean, reliable and affordable energy, as well as the number of jobs made possible by the refurbishment project. Click on the image of the infographic to download your copy.